Yeah It's Nice, Bron, But Was It Worth It? In answer to the question I'll say a resounding, "Probably." 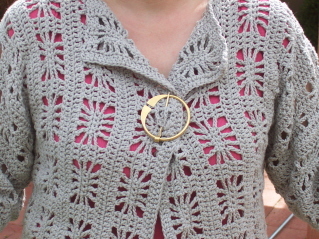 Pattern - Spiderweb Cardigan from the latest IK Crochet. Yarn - 6 1/2 skeins Cotton Ease in "Stone"
The fronts & back are crocheted from side to side. When I finished the first side as per the directions for a 45" finished size, I knew that something was terribly wrong. Remember this pic? The pattern calls for 5 pattern repeats - obviously way too many especially when you think that the OTHER side would have 5 also! Sheesh. 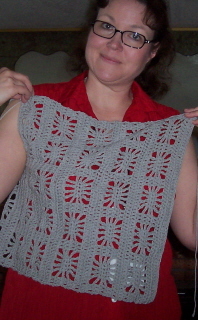 So - I changed it to 4 pattern repeats which cut 3 1/4" from each front. 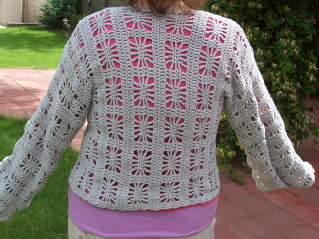 Then, when I got to the back, I crocheted to the design specs - 6 pattern repeats. I measured my shoulders & that fit just fine. Then I crocheted another 4 repeats for the other front - after agonizing a bit over matching them or having them be asymmetrical. The way I ended up wearing the sweater, I'm glad I made them matching! Now - during all this modifying I also had to make the armholes bigger. 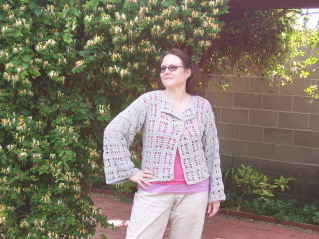 The armhole size is the same in the pattern whether you're making the 32 1/2" size or the 52". We all know that's a crock! So, when I got to the armholes, I ended 6 stitches short of the count shown in the pattern for the front, then added six stitches to my count for the back. That gave me the equivalent of one spiderweb pattern (although I had to do some additional fudging when I got to the actual sleeve part.) That full pattern rectangle added a little over 4" to the armhole, which ended up being 20" around - plenty of room! 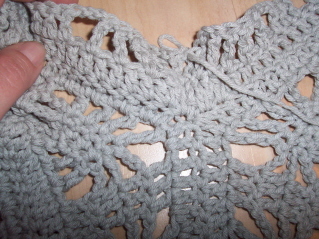 I added 4 stitches at the bottom (two on each side of the seam) and decreased 3 at the top. I did all of that over the space of two rounds so it's barely noticeable. When I finally got all this done and tried it on, I realized that just sewing up one spiderweb rectangle on the neckline wasn't enough. The thing was literally falling off my shoulders. I sewed up one more and, while I lost much of the "carefree, fall open front" feel that I liked about the original, I gained a fold-back type collar that I like even better. :) I think it adds interest to a plain front - the big pin definitely gives it a focal point too. 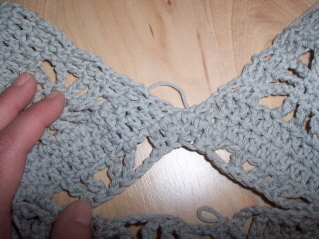 I have a 42" chest and I'd suggest 3 pattern row repeats per side for the pinned straight across look.